The trains of balls are designed to a contact angle of 45° which enables it to bear an equal load in radial, reversed radial and lateral directions. Therefore, it can be applied in any installation direction. Furthermore, MSG series can achieve a well balanced preload for increasing rigidity in four directions while keeping a low frictional resistance. This is especially suit to high precision and high rigidity required motion. 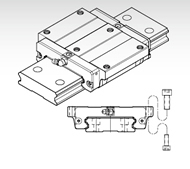 By design,the ability to use a single rail and to have the low profile with a low center of gravity is ideal where space is limited and high moments are required.